Have Championship Latin Ballroom Dancers at your next event and you will be adding pizzazz and class! Noel and Victoria are creative, talented, charismatic, energetic and fun. They incorporate familiar tunes with classic ballroom dancing and comedy to create that movie dancing style into a live performance. From Latin to Standard, they can assemble a program to match the style you are looking for with the glitz, glamour and rhinestones included. Whether it be cabaret style or a full show performance, Noel and Victoria can deliver as they have experience entertaining the hotel, resort and cruise industry for over 10 years. Do you want to add more to your event? Have a Group Dance Class also! It was great they did a good job! Thank you so much it was a beautiful venue and many beautiful people to perform for! Live performance in either a stage or cabaret style. Dancing instruction for your group before or after a demonstration. "Dancing with the Stars" style instruction and judging parties. Professional costumes and choreography. Noel and Victoria are International Latin Ballroom Champions and are also 2006 U.S. Ballroom Cabaret finalists. Some of their achievements include: Asian Open Dance Championship Finalist, USISTD Championship Finalists, NDCA US National Championship Finalists, as well as many regional titles. They have trained with the world's best coaches for many years and are well known by many in the community. Noel and Victoria are currently from Miami, Florida, but are originally from very different areas and backgrounds. Noel is originally from Richmond, VA having started dancing at the age of 15 in the local clubs. By the age of 19, Noel was in several local dance competitions before joining a 5-man hip-hop formation team which eventually got him on television doing backup dancing for performances. Victoria is originally from southern Russia and began her dancing as a small girl at the age of 6 with her local ballet school. She continued her ballet until she came to the U.S. to study at Virginia Commonwealth University where she studied modern dancing for three years as well as starting her career in ballroom dancing. Eventually they met and Victoria convinced Noel to switch to ballroom dancing. They have since been competing and training for 10 years together forming a very successful partnership. In addition to their competition schedule, they have also made special appearances and performances on television in the U.S. (such as ABC's "Good Morning America" as well as on CBS) and abroad to spread the excitement of ballroom dancing to the world. They have been seen performing for some of the best resorts and hotels such as Marriott Renaissance, Ritz-Carlton, Hyatt, and Sandals Beaches Resorts. 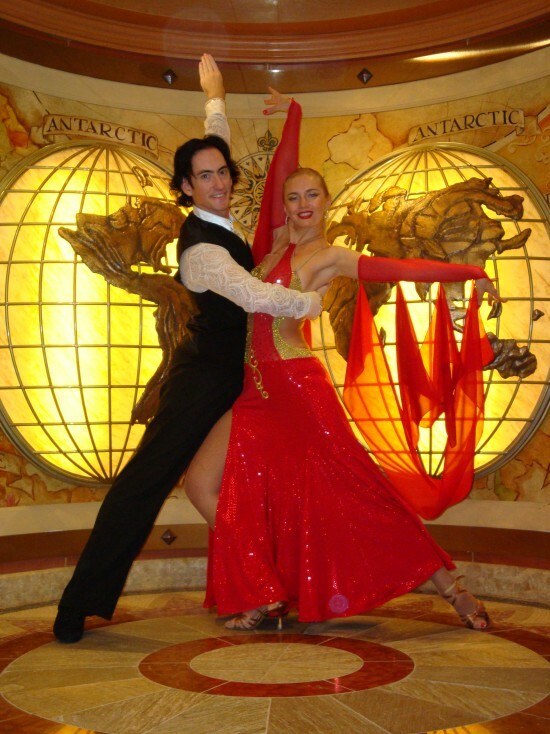 In 2005 Noel and Victoria began entertaining the cruising industry with their Ballroom performances on such lines as SilverSea, Crystal, NYK Cruises, Regent, Royal Caribbean, Princess and Holland America. Contact us for customizing the styles needed for your event.